Between a presidential candidate making a border wall the centerpiece of his winning campaign and debates over whether local or state officials were doing enough on the complicated issue, illegal immigration was at the forefront of the political landscape in 2016. 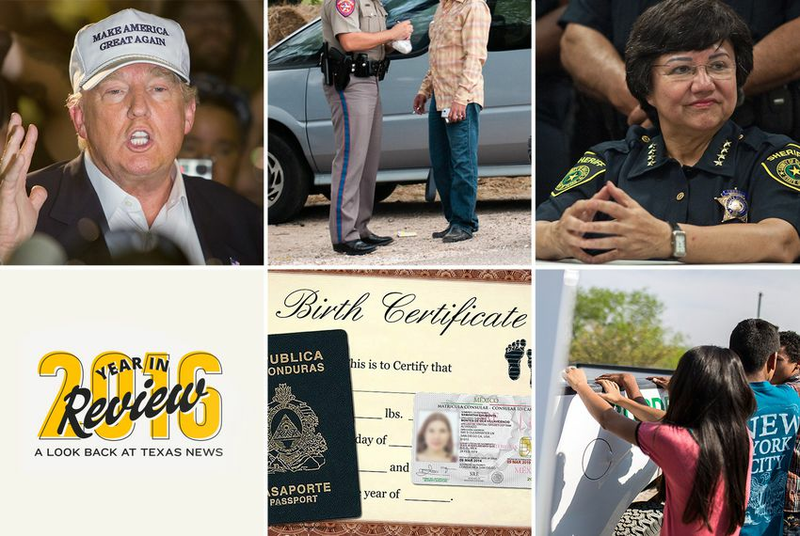 Here's a look at the year's biggest stories related to immigration and the border, all of which could reverberate during next year's legislative session in Austin and the upcoming transition of power in Washington, D.C. In 2015, Donald Trump, then a new candidate for president, quickly sparked outrage among border residents and many Democrats after he said Mexico was sending “criminals” and “rapists” to the United States and promised to build a “big, beautiful” wall on the southern border. He also vowed to eliminate NAFTA, a 20-year-old trade deal that has made some Texas cities among the busiest trade hubs in the country. In 2016, with little change in his rhetoric, Trump survived the Republican primaries and withstood a grueling general election to be elected the next president of the United States. The real estate mogul’s surprise victory immediately sparked fear in some border communities, as residents wondered whether Trump would make good on his promise to deport millions of undocumented immigrants. Although he scaled back his tough deportation talk concerning DREAMers — immigrants brought to the country illegally by their parents or guardians — in December, uncertainty still lingers. Trump's recent decision to tap Gen. John F. Kelly, a retired four-star Marine general and outspoken border security hawk, as his pick to lead the Department of Homeland Security prompted several analysts to conclude Trump’s administration plans to take a hard-line approach to immigration policies. The issue of “sanctuary cities” — a term that broadly refers to a local government that doesn’t enforce federal immigration policies — was once again at the forefront of state politics in 2016 after Gov. Greg Abbott continued a fight he started the previous year with Dallas County Sheriff Lupe Valdez. Abbott accused Valdez, a Democrat, of creating a sanctuary city in Dallas after she said in an interview she’d limit cooperation with Immigration and Customs Enforcement when the agency makes requests that deportable immigrants be handed over for possible removal. Valdez later said her words were taken out of context and that her jail never declined to turn over a person to federal authorities. (A 2016 Texas Tribune analysis revealed most Texas jails cooperate well with ICE). Still, Abbott threatened to cut off state funding to any county sheriff’s department that didn’t cooperate with immigration officials. The issue was also a major talking point for several GOP candidates who won their primaries and general elections this year. Afterward, several lawmakers filed bills for the upcoming legislative session to ban sanctuary cities. Both Abbott and Lt. Gov. Dan Patrick have described the legislation as a priority next year. A recent influx of women and children from Central America crossing the Rio Grande into Texas and seeking asylum slowed some in 2015, only to regain strength this year. Agents in the Rio Grande Valley sector of the U.S. Border Patrol came across about 52,000 families and about 36,700 unaccompanied minors during the 2016 fiscal year. That’s compared to 27,400 and 23,864, respectively, the year before. The federal government's 2016 fiscal year began in October 2015 and ran through September 2016. Overall, the total number of apprehensions on the country’s southwest border increased by more than 77,500 to 408,870 in 2016, compared to 331,333 in the prior year. Though the Rio Grande Valley was the epicenter of the exodus, the figures show that each sector in Texas saw at least a double-digit percentage increase in 2016. In the Del Rio sector, apprehensions of unaccompanied minors increased by 18 percent and family units by 66 percent. In Big Bend, the increases were 13 and 30 percent, respectively. The Laredo sector saw a 20 percent increase in apprehensions of minors and family units, while the El Paso sector, which includes New Mexico, saw an increase in minor apprehensions of 134 percent — from 1,662 in 2015 to 3,885 in 2016. The overwhelming majority of the undocumented immigrants — most of whom say they are fleeing violence and poverty in the Northern Triangle countries of Guatemala, Honduras and El Salvador — turned themselves into law enforcement on the border and were then processed by immigration agents. When lawmakers approved a record $800 million for border security efforts in 2015, border Democrats balked at what they said was a waste of money. The majority of the people crossing illegally, they argued, were women and children fleeing violence and poverty and not people intent on harming Texans. In 2016, those cries grew louder when lawmakers accused the state’s Department of Public Safety, which received the lion’s share of the money, of failing to provide data that showed the effort was working. Instead lawmakers from both sides of the aisle said that although DPS was able to make security improvements in Starr and Hidalgo counties, smugglers simply adjusted their routes and entered Texas through adjacent counties. But Texas DPS Director Col. Steve McCraw said that wasn’t an anomaly and instead assured budget writers that the outcome was what the agency expected. A quick fix was never a possibility, he said, and securing the entire border would take more time. The agency also told lawmakers that it would seek about $300 million in additional monies to keep the surge going. But with the price of oil and the decline in the natural gas industry, budget writers expressed doubts in October about whether DPS will get everything it asks for during next year's legislative session. In June, the U.S. Supreme Court finally put an end to an executive order issued by President Obama in 2014 that sought to let as many as 5 million undocumented immigrants in the country live and work without the fear of deportation. Obama issued his deferred action order in November 2014, but Gov. Greg Abbott, then the state's attorney general, quickly filed suit to stop the program. Twenty-five states would eventually sign on to the lawsuit. The program was scheduled to take effect in February 2015 but was halted that month by a U.S. district judge in Brownsville, who ruled that it violated the Administrative Procedure Act, which governs how federal regulations are made and how much input the public has. The White House asked the U.S. Fifth Circuit Court of Appeals to let the program proceed but was denied twice. In July, the White House asked the Supreme Court if it would reconsider the case when it had a full bench. It is still one short since the February death of Justice Antonin Scalia. But in October the court announced it would not take up the case again, leaving in place the lower court ruling that blocked the program.